Everyone has their thoughts on the whole 'Don't touch My Hair' debate in the Natural Hair world. While I'm not on the defense about people ASKING to touch my hair, I will get upset if you decide to peruse my curls without my consent. Really, who would touch any BODY without consent? It's not so simple for others and asking to touch a black person's hair has become a 'touchy' subject. In an effort to help people get passed the mystique of black hair, Antonia Opiah (www.un-ruly.com), decided to stage an interactive art exhibit allowing passerby's to touch, caress, and fondle various styles of African American hair. 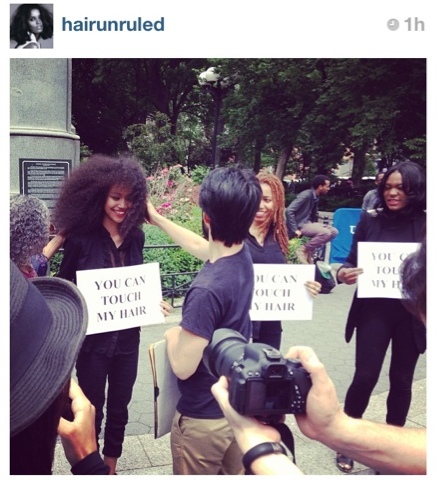 Her, 'You Can Touch My Hair' event is being held in New York City's Union Square. She wants to break the curiosity barriers that Americans have for African American hair. Readers on my Twitter timeline were debating if an exhibit like this is even 'worth it'? Some thought it wasn't right that women, black women, had to put themselves on exhibit just for 'white people' to understand that our hair is just different. @WrittenByBene equated the movement a 'petting zoo' to help white people feel comfortable. Even on Opiah's website, commenters were not pleased that the event was planned and felt like it was an embarrassment for black women to subject themselves to this. However, number of twitter followers were excited by the movement. Take a look at #YouCanTouchMyHair hashtag on twitter and you see opposing sides of this debate. I'm still at a crossroads. Knowing what black people have gone through to attain our sense of cultural pride despite every attempt to take our pride away makes movements like this seem like a slap in the face and a step back. But, bridging cultural gaps and explaining cultural differences may be the only way to make America a better place. So, what do you think? Hit the comment section below. Look at her, she's so pretty! My graphic designer, the team, and I have discussed and slaved over the new logo for about 3 months. It was important for me to have an image that represented the community, the readers, and Nashville. This image will be used to promote our events, products (shirts, pins, stickers) and soon-to-come literature. We debuted the new look on the Facebook Fan Page <=== make sue to join us! There's big things happening for the site and I'm happy you readers are along for the ride. Make sure to visit Becky Russell, owner of BeXclusives graphic design - www.bexclusives.com - she will hook you up with something custom! DISCUSSION: What if the First Lady was Natural? The photo above has caused quite a stir on Facebook. Someone photoshopped a picture of First Lady, Michelle Obama, wearing a curly fro. The photo, a fake, had natural hair mavens hoping and wishing that our first lady would rock natural curls. This photo just brings up more concerns and question in the lives of women who want to wear their hair natural. Is natural hair really accepted the higher on the ladder you go? If Michelle Obama, wore an afro hair style, do you think it would help Barack's re-election campaign? Could a woman with a full, yet styled, afro run for official office? 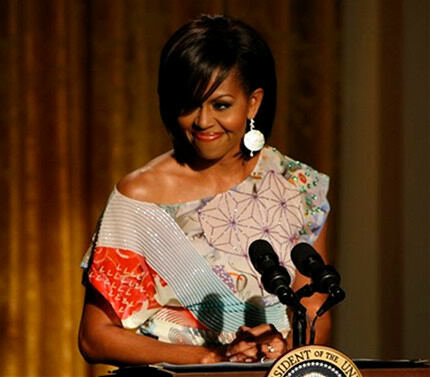 Would Michelle, rocking an afro, help or hinder the natural hair movement? Would this hair style make Michelle less approachable to women of ALL races? These are just questions that popped in my mind when I look at the picture. Michelle Obama has never been one to shy away from breaking the status quo. But would she go #TeamNatural? Hmm, let's discuss. Discussion: Steve Harvey doesn't like natural hair? 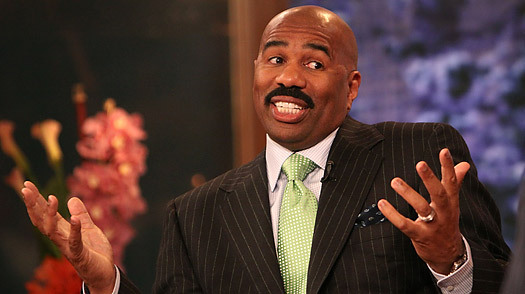 Seems to me that Steve Harvey is throwing shade at women who choose to wear their hair naturally. Read more . . .
One person is looking for love and he/she has to choose to go on a date with one of two prospects. The looker gets to speak to and ask questions to both potentials on the air, while Steve and his team comment on the answers. Of course, this is morning radio comedy show so Steve, Shirley, Nephew Tommy, and Carla have quick quips about the randomness of the answers or the questions. The set-up makes the dating process fun and bearable to the listeners while the contestants are "Locating their Love." This week the person looking for love was a guy named Ryan, an upstanding sounding guy who mentioned he was Christian and didn't mind paying for his woman to "Look Good". He was interviewing two potentials - Carmen and Letiesha (seen here). During the interview, Ryan asked the ladies how they wear their hair. Carmen was the first to respond, saying that she was natural and her hair had lots of little curls. Before Ryan could comment, Steve threw his 12 cents by saying: "Uh-oh, Uh-oh . . . cool my a$$ . . . what do you mean my 'You wear your hair natural' . . . well I gotta check . . . I like a woman to comb her hair . . . I don't need to feel like I need to pick your hair . . .I don't want to go through that." Letiesha responded that her hair was "long . . . I DO have a relaxer . . . I am not natural at all." After that portion was over, Ryan chose to go on a date with Leteisha and both agreed to come back to the show and talk about the experience. Here's my issue: Was it so crucial for Steve to go all the way in about how he doesn't like a woman with natural hair? I know he is making jokes for the sake of being funny, but in this day, when going natural is so popular and women need support during this transition, why is someone as revered by women going so hard on ladies with natural hair? Shouldn't male and female celebrities support women (in general)? And, what makes it ok, for people to associate natural hair with unkempt hair? In my opinion, Steve Harvey should apologize for his harsh comments (made in jest - I know) to the natural hair community. 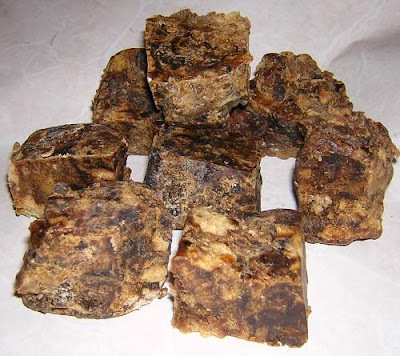 We already fight hard to wear our hair in it's natural state without having to explain to everyone the whys, the whens, and the hows of this 'process' called "Going Natural". 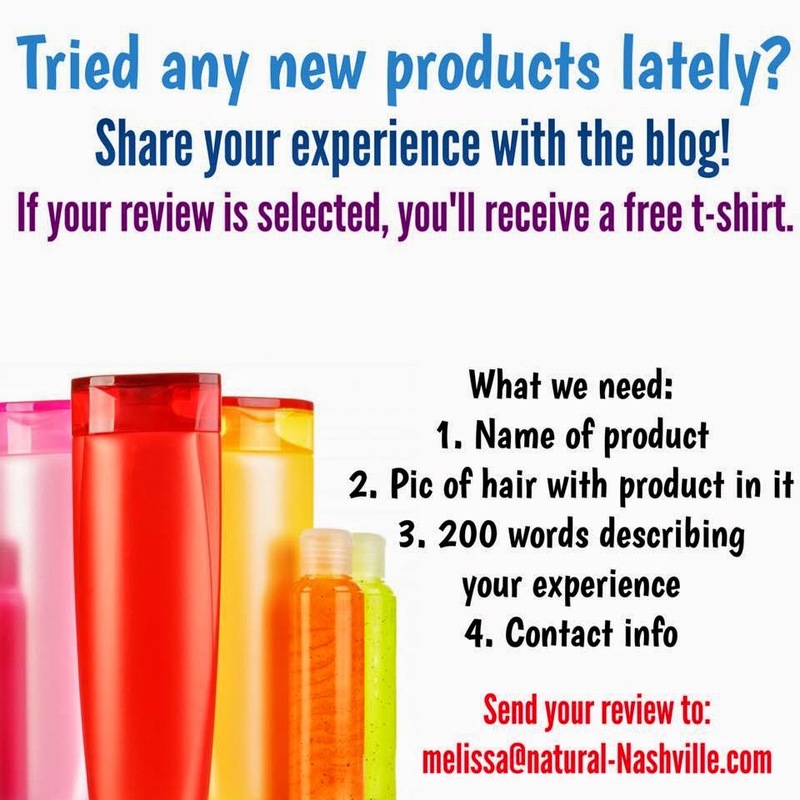 DISCUSSION: So your boyfriend doesn't like your natural hair? This video has been floating around the internet streets for a couple of days and it's amazing! Video Blogger, Drew (@sjs856) recorded this adorable video filled with encouragement for the ladies of the natural hair community. Drew used lots of humor and a surprising amount of natural hair terminology to help ladies describe the natural hair transition. Drew's commonsense aproach just makes so much sense! In the end, if you guy isn't feeling your 'do, big chop him too! 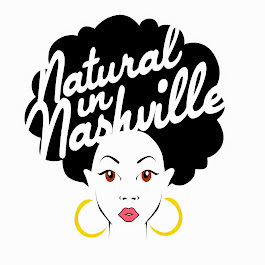 On Saturday, Novemeber 19, bring your curls, coils, and kinks to the CURLY TALK Natural Hair Meet-up! 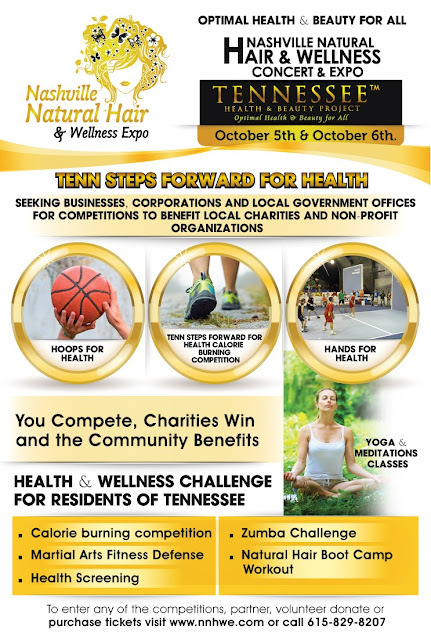 Guest speakers - The Natural in Nashville team will be on deck to talk about the natural lifestyle!! A swag bag filled with goodies from over 10 different sponsors! Raffles, Door Prizes, Special Giveaways, and vendors will be on site! FREE REFRESHMENTS AND DRINK SPECIALS ALL NIGHT! A lot of us will admit that the TSA has been a little extreme with the pat down searches lately but this takes the cake. Isis Brantley, Dallas hairdresser to Erykah Badu, was practically chased down recently by Atlanta's TSA to search her sizable coiffure for explosives. According to the TSA she left the security checkpoint before being thoroughly searched but Brantley claims that is untrue. She makes an arguably valid point when she asks if Dolly Parton or Cher ever had their searched. The reporter even questions if The Jersey Shore's Snooki ever had her checked by the TSA. Question: Is anyone else a little taken aback that they referenced the movie Undercover Brother for this story or is it just me? Anyway, the TSA issued a statement saying that they offered Brantley a private screening. Now while this may have cut down on the public humiliation she says she experienced, she would've felt humiliated and violated nonetheless. What do you all think? Was the TSA being fair with their precautionary search?